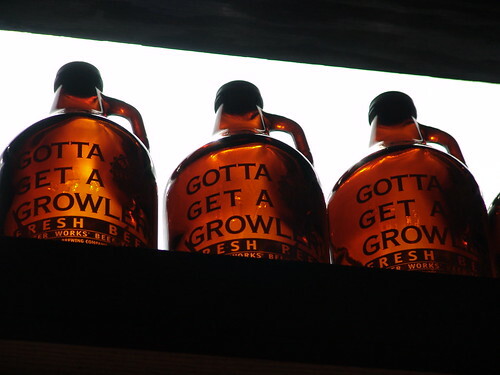 Growlers are making a comeback. These reusable half-gallon bottles used to transport beer from pub or brewery to home date back at least to the late-19th Century and are reentering the modern vernacular as beer consumers become more cost-, quality-, and environmentally-conscious. According to The New York Times, beer-to-go is both legal and growing in popularity. National chains such as Whole Foods are getting in on the action, and beer aficionados everywhere are rejoicing. At a cost of roughly $4 to $12 per half gallon (and a even a bit more for true specialty beers), a full growler beats the price of a six-pack any day. Hm … never heard the term “growler”. Now I know! I’ve recently seen a few stores offer deposits on returnable bottles … it’s an old idea but a good one and encourages reuse! Those are awesome. I am an avid fan of bottles and different styles and I definitely want one of them. Haven’t seen these around but those look really cool. So big too!